The University Orthopedics Sports Medicine Center takes pride in supporting the many communities we serve. We serve as team physicians for many professional, collegiate and high school athletic teams in our area. High school teams served include the communities of Barrington, Rogers, Portsmouth, Middletown, Portsmouth Abbey and St. George's. Salve Regina Athletics sponsors 19 NCAA Division III varsity sports for men and women. The Seahawks compete in CCC, NEFC, NEISA, ECAC Northeast, and ECAC East. RWU includes 22 outstanding varsity athletic teams whose achievements speak for themselves. A Volvo Ocean Race crew includes eight sailors plus one non-sailing multimedia reporter onboard the standard teams. All-women teams can race with 11 sailors plus one non-sailing multimedia reporter. At University Orthopedics, we want you to get back in the game, whether that means sports, work, or just everyday life. We provide specialized care for our surgery and rehab patients, as well as those suffering from work-related or sports injuries. We specialize in providing comprehensive sports medicine services including the diagnosis, treatment, and rehabilitation of athletic injuries. Regardless of the level of the athlete — recreational, high school, college, or even professional — University Orthopedics strives to get every injured athlete back to their favorite sport or recreational activity. Rehab efforts are designed to relieve pain, strengthen the joints, muscles and tendons, and then simulate the activity required in the specific sport. Our physicians, for example, are proficient in the latest minimally invasive surgery techniques that enable most patients to have surgery and to be home the next day. We want you to get back in the game at University Orthopedics, whether that means sports, work or just everyday life. We provide specialized care for those people suffering from sports injuries. The specialty of sports medicine involves evaluation, treatment and rehabilitation of the injury, as well as focusing on prevention of future re-injury. This emphasis on prevention ensures a positive recovery, an improved quality of life, a safe return to sports. Our sports medicine physicians have worked with athletes who are expected to perform at peak performance in demanding sports like football, basketball, hockey, baseball, etc. This experience also helps us address the special needs of the weekend athlete who wants to recover from injury to perform at the same pre-injury level with sports like running, golf or tennis. We try to provide this attention to every patient who visits our practice and wants to get back to their favorite sport. Regardless of the level of the athlete — recreational, high school, college, or even professional — our goal is to help the injured athlete back to their favorite sport or recreational activity. Rehab efforts are designed to relieve pain, strengthen the joints, muscles and tendons, and then simulate the activity required in the specific sport. The University Orthopedics Sports Medicine Center includes board-certified orthopedic surgeons who are fellowship-trained in their specialty, the highest level of medical training in the U.S. The center includes diagnostics like X-ray and MRI, along with an exercise gym with physical therapists experienced in knee, foot/ankle, shoulder, elbow and hand injury. This rehab team takes a comprehensive approach to treating sports injuries all emphasizing an active approach to recovery. If surgery is necessary, the University Orthopedics physicians are trained in the latest minimally invasive surgery techniques that enable most patients to have surgery and to be home the next day. University Orthopedics is the official orthopedic provider of Brown University Athletics. Head Men's Basketball Coach Mike Martin talks about the care our team provides for his as well as the treatment he also received as a player. 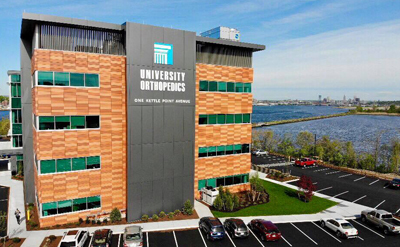 University Orthopedics is the official orthopedic provider of the Providence Bruins. UOI sports medicine Drs. Fadale, Hulstyn and Owens discuss providing care for the Bruins AHL affiliate.